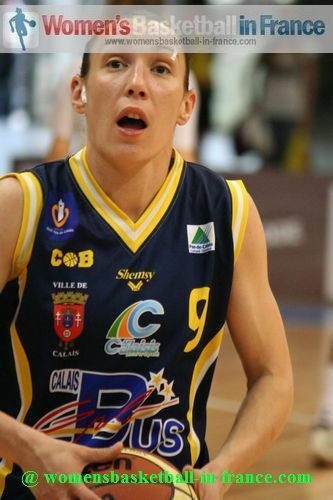 Aurélie Cibert from COB Calais is the wbbif's LF2 player of the month. She edged out Jeanne Senghor-Sy from Cavigal Nice in a close vote. Veuillez trouver en bas de page des informations en français. Cibert has been playing basketball for 21 years. She first started in 1991 with her home town club Maringues. By 1996 she had moved to a bigger club, 31 km down the road at Clermont-Ferrand. Cibert was one of the best youngsters in her region. For the 2000-2001 season she was admitted into the Pôle Fédéral Toulouse (today the CFBB). She was selected for France in the U16 European Championship. On 22 July Cibert had her biggest game in the French jersey scoring 19 points and dishing out 3 assists in the victory against Russia (80-66). For the first time France went on to become European Champions at this age group. Cibert, the history maker, finished her youth international career in 2005 on a high with France winning their first ever U20 European Championship for Women Division A title. Cibert had spent just one season with the CFBB and returned to Clermont-Ferrand in 2001 to stay with them for four seasons. In 2005 she joined Saint Amand in the north of France, spending two seasons at the club but built up a fan club. Since 2007 she has been at COB Calais. For the last three seasons she is the captain of the team. Cibert who is known for scoring spectacular baskets and for her unselfish play has demonstrated recently that she also has good leadership skills. During the month of November she hit 12 three-pointers in her 65-point total while also dishing out 17 assists and making 9 steals. To learn more about Cibert you can listen to an interview (in French) which she gave in 2009 to our friends from the now defunct basketbol.org. A nouveau, Cibert montre une personnalité forte mais aussi d'une générosité pour pouvoir mener son équipe, COB Calais, d'une réussite à l'autre. Elle a été élu meilleure joueuse L2F pour Novembre par nos lecteurs en démonstrant son sang-froid avec ses tirs primes aux moments cruciaux, accumulant 65 points, 17 passes décisives et 9 interceptions pour ce mois-ci. Pour plus d'informations sur Cibert, regardez la vidéo, conduite par le défunt basketbol.org.